John Tavares and Mitch Marner each had a goal and two assists, and the Toronto Maple Leafs defeated the visiting Buffalo Sabres 5-2 Saturday night. Morgan Rielly, Nic Petan and Nikita Zaitsev also scored a goal for the Maple Leafs, who have two home wins over the Sabres in the past six days. 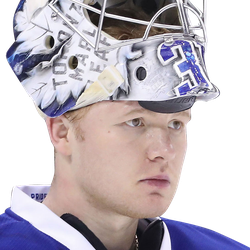 Frederik Andersen made 35 saves for Toronto. Jason Pominville and Conor Sheary scored for the Sabres. 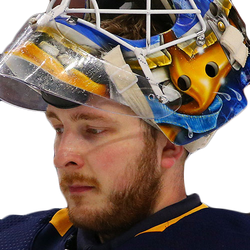 Linus Ullmark started in goal for Buffalo for the second game in a row and made 27 saves. The score was tied 2-2 after the first period. Tavares scored his 37th goal this season at 4:20 of the first, flipping the puck into the net when Ullmark failed to cover it in the crease. Pominville notched his 15th of the season at 6:00, going to the backhand after pouncing on a loose puck in the crease that Andersen neglected to smother. Buffalo took the lead when Sheary scored his 12th goal, and third in two games, when he controlled a rolling puck and shot from the high slot at 7:34. The Maple Leafs tied the score at 19:40 of the first when Rielly took a return pass from Auston Matthews to record his 16th goal this season. Ullmark seemed to have made the save on the shot from the point but the puck squirted through the five-hole. Toronto scored twice in the second period. Petan scored his first goal this season, converting a pass to the slot by Trevor Moore at 15:02 of the second period to give the Maple Leafs a 3-2 lead. Petan was playing his first game for Toronto after being obtained in a trade with the Winnipeg Jets. Zaitsev scored his third goal this season at 19:05 of the second when his pass from the right flank deflected off the skate of Buffalo defenseman Brandon Montour, who was occupied with Toronto's Zach Hyman at the edge of the crease. Marner scored his 23rd goal into an empty net at 18:03 of the third.